The Hunter River Railway Company was incorporated in 1853 to build a railway between Newcastle and Maitland. Construction started on the Hunter River Railway in 1854, which was to become the Great Northern Railway. Due to lack of financial support, ownership of the company was transferred to the NSW Railway Commission. The Great Northern Railway was officially opened on 30 March 1857. The line only extended from Honeysuckle Point to East Maitland, with West Maitland Railway Station opening on 28 July 1957, and Newcastle on 19 March 1858. This rail corridor was, and still is, part of a vital transportation system for the coal industry. Today, the railway branch lines are essential for delivering coal to the shipping wharves. 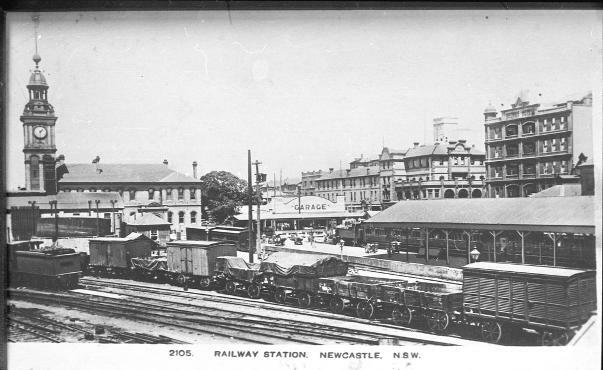 Newcastle Railway Station. From the Bert Lovett/Norm Barney Collection, University of Newcastle, Cultural Collections.